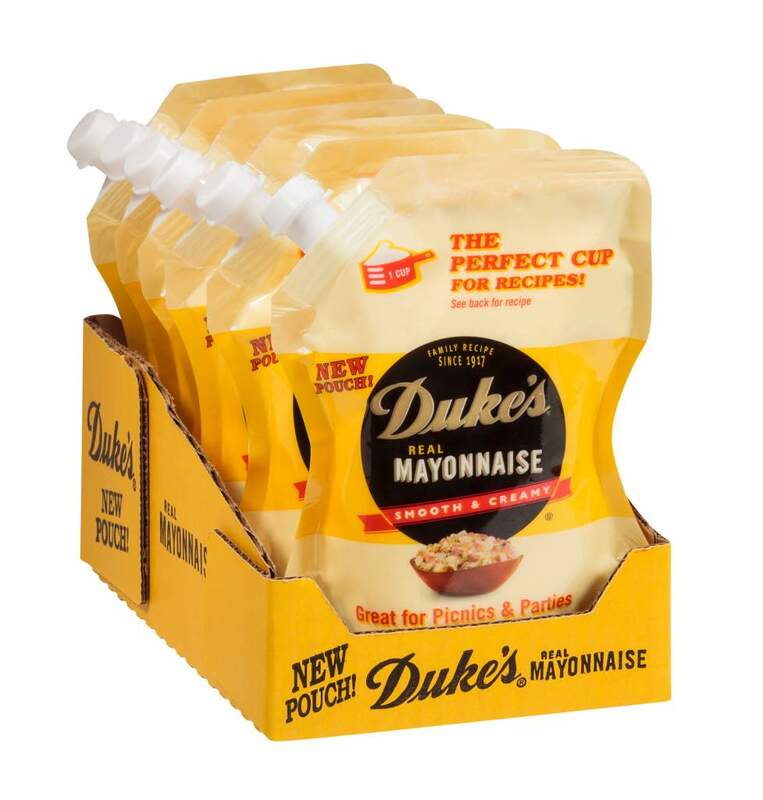 Duke’s Mayonnaise is an iconic regional brand with loyal fans across the South. When a product is this well-known, you don’t just get up and make big changes. However, that’s exactly what C.F. Sauer, owner of the brand, is doing. While the company isn’t changing the recipe or the flavor of the mayo, it is making a major change in the product’s packaging. Considered one of the basic condiments of the kitchen pantry, mayonnaise packaging hasn’t changed a lot over the years. While some manufacturers still offer the product in quart glass jars, the current standard is rigid PET containers. Most have downsized the 32-oz container to 30-oz. Duke’s continues to offer a 32-oz PET wide-mouth jar. CPGs also have begun moving to PET bottles in smaller, squeezable, convenience sizes with flip-top lids for easier use. Now, C.F. 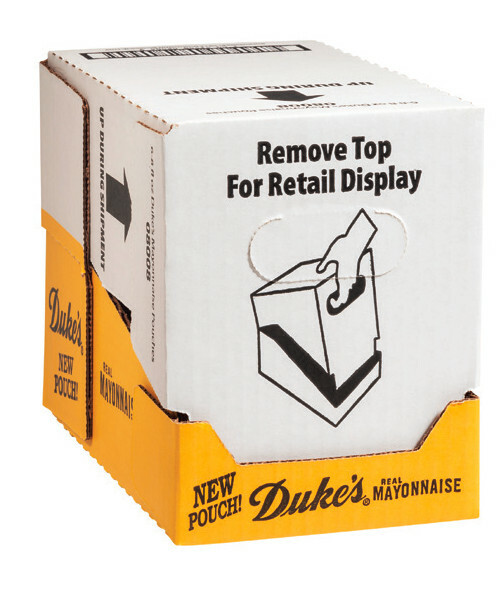 Sauer has taken the next step, offering Duke’s in 8-oz, stand-up pouches that are being distributed to retail channels in Cabrio Case shipping cases that easily convert to shelf-ready trays. Development of the pouch and shelf-ready secondary packaging was nearly a two-year process, according to Cecilia Brock, packaging engineer and project manager. The change required not only a redesign of the packaging itself, but the addition of a whole new packaging line at C.F. Sauer’s plant in New Century, KS, near Kansas City. The idea of pouch originated from the C.F. Sauer Retail Marketing and Sales group. Erin Hatcher is the Duke’s brand manager, and responsible for the consumer studies, marketing, and graphic design elements of the project. Brock says multiple studies were performed to ensure consumer acceptance prior to launch. The company has completed the packaging redesign and installation of new equipment. It began shipments in July to a number of grocery stores, including chains, such as BiLo, Harris Teeter, HEB, Walmart, and Winn Dixie. The company is accompanying its launch with an aggressive campaign to inform loyal users about the new packaging and to educate them on its benefits. In shipping and retail displays, stand-up pouches can require more protection and support from the secondary packaging. That is why C.F. Sauer elected to use the Cabrio Case designed by Delkor Systems. It serves the dual function as a shipper and display case. Each Cabrio Case contains six pouches, enabling it to be used in a wide variety of retail applications from convenience stores to supercenters. The blanks for the cases are provided by International Paper (IP). Brock says C.F. Sauer worked with IP to integrate the graphics on the pouch and the case to present a more attractive display that will capture shoppers’ attention. Brock says one selling point of the Cabrio Case is its stacking strength. Many shelf-ready cases lose stacking strength due to perforations used for easy opening, but the Cabrio Case design overcomes that weakness. Two of the cases also can be glued together into a single shipper in which both lids can be removed with a single pull and separated for display. The case also reduces the amount of corrugated board required versus an RSC case, she says. Overall, retailer response on the pouch and the case has been extremely positive. Rominger says retailers support the company’s efforts to bring innovation to a category that has not seen much new activity. Brock points out that vendor support was crucial throughout the redesign. Doug Andersen, national accounts manager for Ampac, which developed the films used in the pouch, says C.F. 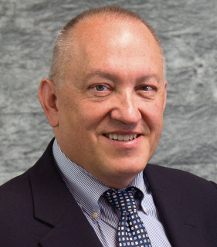 Sauer did a first-class job on the project by involving multiple companies very early in the process. The pouch itself is gusseted to allow it to stand up, but has a pinched waist with inward curves on both sides. This gives it a different look than many rectangular pouches currently on store shelves. The shaped pouch employs bright colors on its billboard front facing to emphasize the branding and to grab attention. Shelf stability in the pouches is a key factor, so the companies developed two types of laminated structures. One, using PET, is designed for domestic use. An export version uses an aluminum layer to extend shelf life and increase puncture resistance. Another important element in the pouch design is a fitment designed by Westrock with a cap that allows easy opening and closing. Unlike screw-on caps, the Duke’s pouch has a flip-top with a latch-back feature in the open position. While many closures used on pouches are made with polypropylene, this one uses HDPE (High Density Polyethylene). The HDPE fitment seals well to the pouch’s high-barrier multilayer film. Because the fitments are attached prior to filling, the cap also has a liner induction-sealed to the cap to prevent contamination or tampering. The pouches are filled on a Mespack H-320-FED horizontal form/fill/seal machine. Brock says the line currently runs about 100 pouches per minute. The cases are formed on a Delkor Trayfecta former. The pouches go through an X-Ray detection system before being hand-packed into the Cabrio Cases and sent through a Delkor Capstone closer. The company also purchased a Delkor combiner that can be used to combine two cases into a single unit after loading.